As I’ve mentioned a couple of times now, I have recently acquired a TRS-80 Model 100 and a Tandy Model 200, two very early and very impressive laptops. Since these laptops predated inexpensive memory both in the form of RAM and permanent storage, there isn’t any room on them to store very many BASIC programs. Further, their primary purpose is writing, and it would be nice to get the writing off of the laptops and onto, say, this blog. The laptops both have several communications options, but as they are options from 1983/1984, none of them are Internet, Bluetooth, or WiFi. I ordered a RS-232 to USB adapter and delved into Python’s serial port extension module, pyserial. This stuff is ancient; so much about communications nowadays is handled by software that I’d completely forgotten the need for a null modem adapter to switch the transmit and receive lines in RS-232 when connecting two computers directly to each other. Further, it isn’t used enough to justify drivers that don’t crash your computer. After running these tests on my iMac using the Prolific drivers, I now habitually unplug the serial adapter and reboot the computer. If I don’t the computer will reboot itself within a few hours. And this is the most commonly recommended product/driver combination among people who still use RS232. That working, however, what I needed was very simple. The Model 100/200 does not have any fancy terminal software with downloading functions that automatically recognize filenames and download to the appropriate place. “Download” on these laptops is no more than capturing the incoming data to a file you name, and “upload” is no more than sending out the file you want to upload. I vaguely remember, in the early days of Bulletin Board Services, special codes for noting when a file transfer was about to start so that terminal software would know; these laptops predate that. And all I really need is to be able to transfer text files back and forth. I chose to make the file transfer location be under my Dropbox folder; I named the folder “TRS80”. This way, I can also put things into it and take things out of it on Editorial or Textastic on the iPad. Depending on your system, you may need to change the serialPort variable; it appears that on Mac OS X and Linux, the first USB adapter will be called “/dev/tty.usbserial”, but your mileage may vary. print "Use 98N1E for Model 100, 98N1ENN for Model 200." I subclass serial.Serial as OldSchoolSerial; create an instance of it; and then set those old options that used to bedevil us when connecting to various devices and, if I recall correctly, services. For extra helpfulness, I also print out the correct stat settings for the Model 100 and Model 200 to match these settings. There is nothing special about these choices. I would have used the default options on the TRS-80s, but the default option is to use the built-in modem. After opening the port, I call the special loop method to wait for commands; on CTRL-C or any other form of keyboard interrupt, it calls the closePort method, to ensure as clean a shutdown as possible using these drivers. My experience has been that under some circumstances, closing without flushing will always hang the port. The port will be inaccessible until reboot, and the process will be an unkillable zombie until forced shutdown. The computer will never complete a soft shutdown—the unkillable zombie will block it. I mention this mainly because all the examples of pyserial scripting I’ve seen omit the flush. And yes, this made debugging this script annoying. print "Unknown command: '" + command + "'"
If the command is unrecognized, the script will print the command in hex; this was because invisible characters were often what caused the problem, such as backspaces, misplaced line feeds, or carriage returns. Despite the fact that the script reads one character at a time and ignores invalid characters, they can sometimes slip in. DOWNLOAD to transfer a file from the server to the laptop. Commands are of the form COMMAND option where the command is displayed as uppercase and the optional option is displayed in lowercase. On an ESC or CTRL-C, the command is canceled. A carriage return signals the end of the command. And backspacing has to be handled manually, both erasing the character backspaced over from the laptop’s terminal display and removing it from the command string. Commands must be letters; options can be letters, numbers, and up to one period. The F2 key tells the laptop to start storing incoming data to a file; pressing the F2 key a second time ends the storage. The BASIC program is now saved on the laptop as “check.do”, with an extraneous cursor marker at the end. To run it, exit to the main screen, enter BASIC, potentially type “new” to clear any existing BASIC program, and “merge "check.do"”. Uploading is easier because the command tells the server what filename to save it as. You will have to use ESC or CTRL-C to tell the server that the data has completed uploading. The download (transfer from server to laptop—upload from the server’s perspective) method attempts to do line-ending conversion. This may end up being a pain, but for the moment it seems to work. I found that without converting linefeeds to carriage returns, BASIC programs would refuse to run; it looked as if the lines were mostly run together. You can see the rest of the class in the full script (Zip file, 11.5 KB). Despite the issues with the driver, working with these old workhorses has been a lot of fun. In the future, I intend to use this script on a tiny Linux box dangling from the RS232 port—probably a CHIP. Once I do that, and as I continue to use these laptops, I’ll probably discover ways of making the script more useful. I have been using the C.H.I.P. Linux box with my Python data transfer script (Zip file, 11.5 KB) for two and a half years now to get files to and from my Model 100 and Tandy 200. I’ve improved it considerably over that time, so that it now works with Dropbox to more easily transfer files from the Model 100/200 to my Mac OS X workstation or iPad. Next Thing, the makers of the C.H.I.P., has unfortunately gone defunct, but the script should work on the Raspberry Pi or any Linux computer. 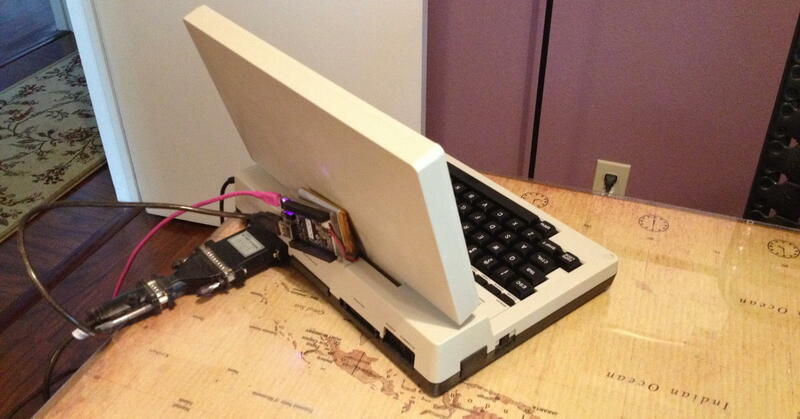 The Raspberry Pi (and probably Arduino) are especially useful because, like the C.H.I.P., they are small enough to fit on the back of the portable. I have a velcro square on the top of my Tandy 200 and on the back of my Model 100, and its twin on the C.H.I.P.’s battery pack. You can see in the photos that while it isn’t pretty, it works well. Other than changing from 98E1D to 98N1D since the last version of the script, the new features mainly involve two things: working with the server, and working with the network. Some of them involve things that were fun to write, but that I rarely use, such as browsing the web or defining words. I’ve also improved the DOWNLOAD process. There’s no longer an extraneous cursor at the end. When you type “DOWNLOAD filename”, it prints a message explaining how to download the file. First, invoke the download function of the Model 100/200; then press another key to start the download. When you can see that the download has completed, revoke the download function of the Model 100/200, and then press another key to get to the cursor. I’ve also improved the LIST command to provide details of files, mainly when they were last updated. A DB25 null modem adapter; something like this is necessary when connecting computers directly: it crosses the transmit and receive lines so that one computer’s transmit goes to the other computer’s receive, and vice versa. This is not the model that I bought—I went to Fry’s to get a no-name one. But Belkin is a good name, so this should work. CHIP at Next Thing Co.
“The World’s First $9 Computer.” Not quite $9 because you have to pay shipping, which is more than the computer. But this should still end up being a pretty amazing choice for building adapters, if not for building actual small computers. Good old Microsoft and their apocalyptic view that we would never reach the year 2000! I just acquired this old Model 100 and it works pretty well. I love the address book and scheduler. They are literally just text files, edited using the word processor function, and searched using a simple search tool. Mac OS X driver for the Prolific PL2303 USB to Serial Controllers. The Python Serial Port Extension provides read and write access to serial ports on your computer. This is a “powerful and fast text editor” both for iPad and Mac OS X. The iPad version has built-in SFTP support making it very useful for editing files on remote servers. An RS232 serial adapter cable for USB-A to DB25/DB9, five feet long. It works; on Mac OS X the driver will occasionally cause the computer to reboot. I’m not aware of anything better out there, however. Primitive data transfer script for the Model 100/200 last modified December 12th, 2018.